Welcome back to the latest installment of the Bacon Month series! 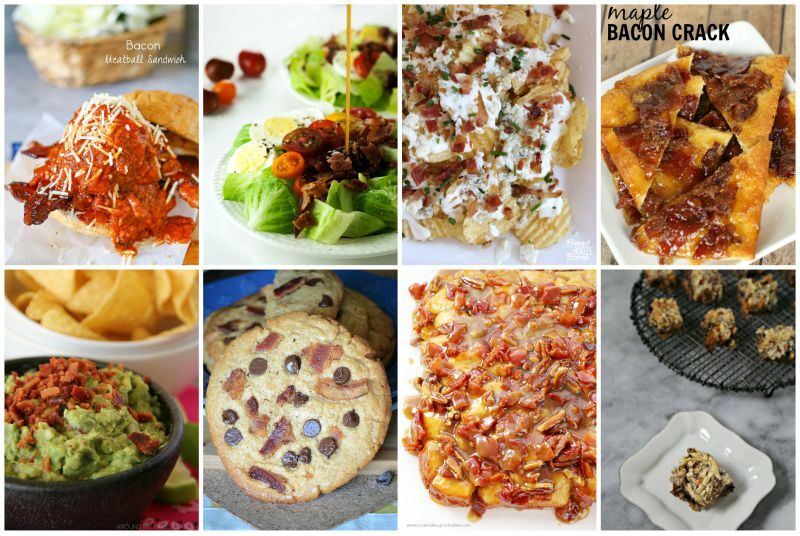 If you don’t know what’s going on, check out my other bacon-filled, bacon-lovin’ posts: Cheesy Bacon Egg Bake, Sweet & Spicy Bacon Wrapped Chicken Skewers, Bacon Jam Grilled Cheese, and Bacon Cheddar Pretzel Rolls! And don’t forget to enter the giveaway too! 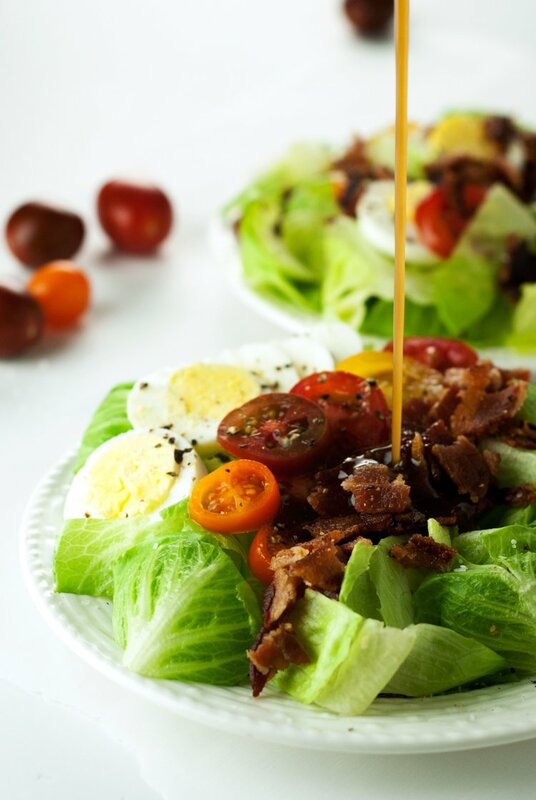 Today we are going for simple, and delicious, with an Heirloom Tomato BLT Salad with Warm Bacon Dressing. I know, it sounds complicated, because it has such a long name. But trust me, it’s not. 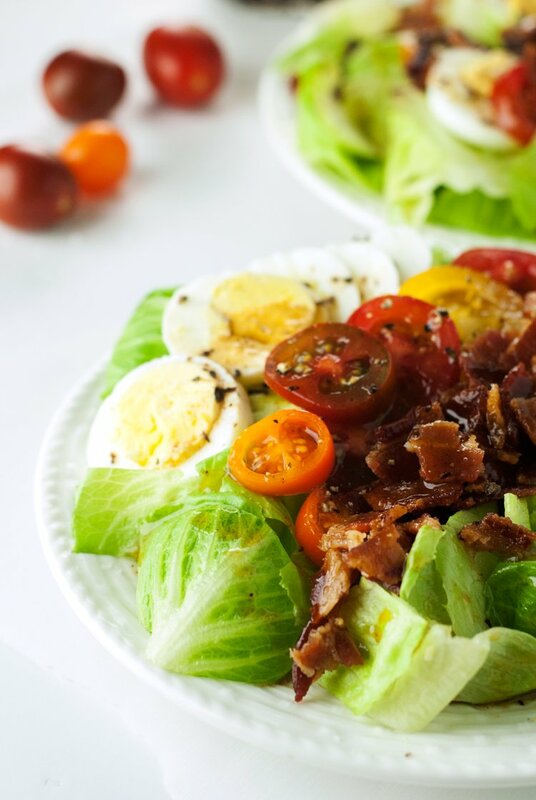 It’s just some lettuce, some bacon, some tomatoes, eggs, and a super simple dressing. But it’s a flavor explosion, you guys. You can get creative with you lettuce choice; sometimes I like to use spinach, but this time I went with romaine because it reminded me more of a salad I used to enjoy at a place called Figlio in Uptown, Minneapolis. Miss Uptown. 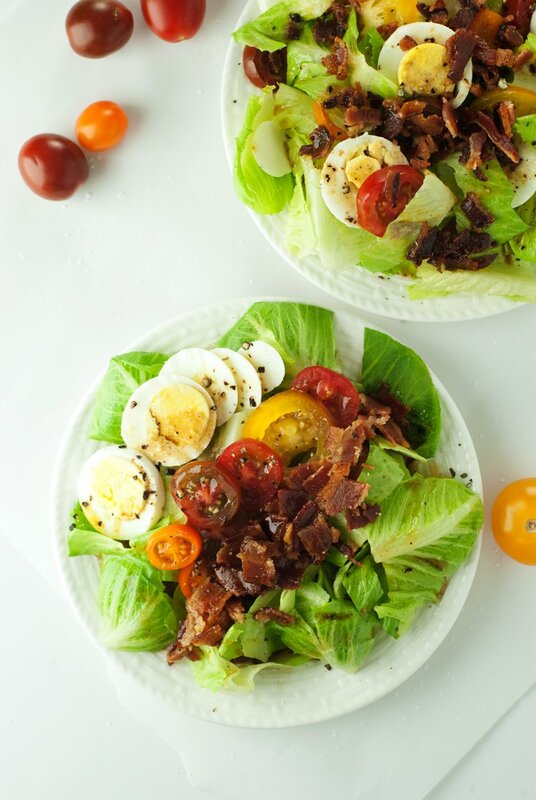 So this heirloom tomato blt salad with warm bacon dressing is a tribute to my long lost love. And hopefully it can be your newfound love. Because, bacon. And bacon dressing. Make sure you check out all the other wonderful posts from today’s edition of Bacon Month! Cook the bacon until crispy either in the oven or in a pan, removing the bacon to a paper towel to drain and reserving the bacon grease. Warm the bacon grease in a small pan over medium heat, whisking in the balsamic vinegar and seasoning with salt and pepper. Crumble in 2 slices of the bacon into small bits, then set aside. 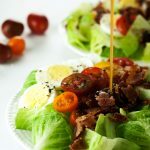 Assemble the salads onto 2 plates, dividing the lettuce, eggs, tomatoes, and remaining 6 slices of bacon equally between them. Drizzle with the warm bacon dressing, sprinkle with additional salt and pepper as needed and serve immediately.